The open MRI scanner at Birmingham Heartlands Hospital is no longer available for private patient scans. It has been decomissioned and is being replaced with a wide bore conventional scanner. A new private upright open MRI facility will be opening shortly in Birmingham. Full details will appear in the News section. Magnetic Resonance Imaging (MRI) produces spectacularly detailed images of a wide range of body parts and conditions. 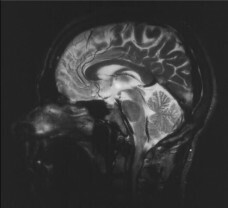 There are some individuals, however, who can find a conventional MRI scanner rather claustrophobic particularly if the scan requires the head to enter the scanner. A new range of scanners known as open MRI scanners can overcome this. Their design is such that instead of an enclosed tunnel the scanner is completely open on both sides and at both ends largely eliminating any sensation of claustrophobia. Open MRI may also be suitable for the ‘larger’ individual who may find a conventional scanner a tight squeeze! 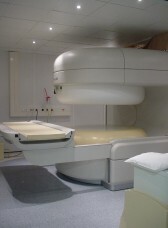 At Birmingham Heartlands Hospital there is a Phillips open MRI scanner (pictured) which is available to private patients outside normal NHS scanning hours. There are some limitations on the type of scan that can be performed on this scanner but it is suitable for most indications. For scanning of areas outside Dr. Crowe’s own fields of interest he will be happy to recommend one of his colleagues with the appropriate subspeciality expertise. Most private health insurance companies will cover scanning on the open scanner. Others, including BUPA, will fund scanning on the open scanner if there is a specific reason (such as claustrophobia) why scanning on a conventional MRI scanner is not possible. For further information or to make an appointment please use the contact form or speak to Dr. Crowe’s secretary on 0121 448 1502. GP and Specialist requests for private patient open MRI can be faxed directly to 0871 – 251 4197.